Rack conveniently holds up to 10 mags, loaded or unloaded. It's compatible with both mil.-spec and polymer mags, from 10 to 30 rounds. The vinyl-coated steel structure is durable and won't scratch / mar surface finishes, so you can rest assured your mags will be stored securely AND safely! 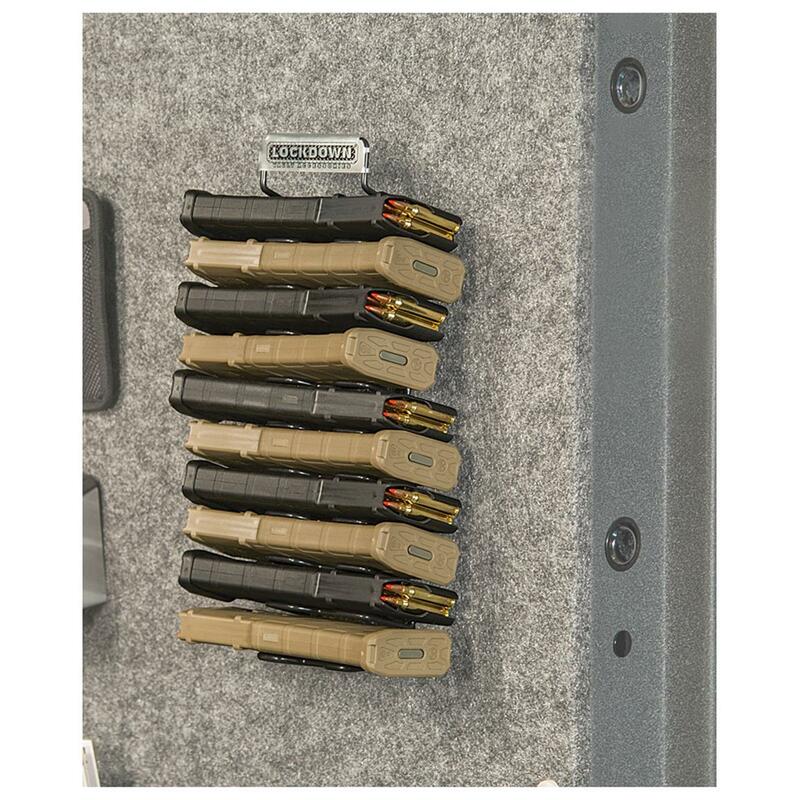 Lockdown AR-15 Mag Rack is rated 4.7 out of 5 by 11. Rated 4 out of 5 by TL77 from Good space saver Does help organize and free up space. Rated 5 out of 5 by Sunshine from Great Christmas present My husband was very excited to get this for Christmas. Since the picture showed the rack full, I was a little thrown off at first. I was very happy it arrived before Christmas. Rated 4 out of 5 by matt44 from good for the price I installed this with out the stand to my stack on gun cabinet door works well with p-mags and hex mags,metal mags are looser but have not fallen out after many closing and opening of the door. Rated 5 out of 5 by Pistol Pete from Great product! Received rack quickly. Fits my magazines perfectly. Great help organizing my shop. Rated 5 out of 5 by WFC1 from Good buy Mounted two of these in my vault, they work well with the Tapco and Magpul mags I purchased. I had other mags fit as well. Rated 5 out of 5 by Woody77 from Compact Mag Storage This Mag Rack is the most compact magazine storage/organizer I've found. The vinyl coated rack can be used with the provided stand or without the stand, it can mount to any wall surface. 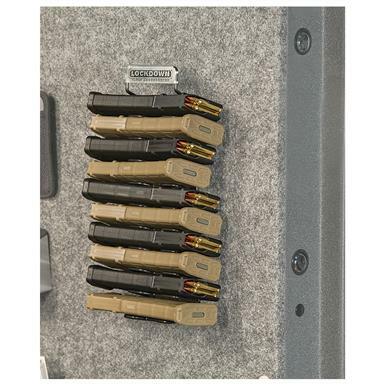 Store 10 fully loaded AR mags, securely and easily. Smart, simple way to stack and store firewood. Keep handguns and other valuables hidden in plain view.